Today’s print once more fell outside consensus expectations, calling for a withdrawal in the high 240s bcf. The underlying root of the miss may be pinned on issues of gas-heating intensity (GHI) (mmcf/d gas burn in res-com per GWHDD). To true up to today’s number, we made a baseline revision to GHI, and also lowered our estimate of gas power burn by 0.5 bcf/d. A crash in res-com heating of 17 bcf/d w/w and another 5.2 bcf/d in gas power demand are walking (or running) down the withdrawal rate. LNG feedgas activity shaves another 2.5 bcf/ w/w from demand. These changes easily trump a 2.5 bcf/d drop in supply. Last week’s cold snap was replaced by an early tease of spring temperatures across the country this week. Given those warm temperatures, next week’s EIA report will likely show a withdrawal close to one-third of today’s print. 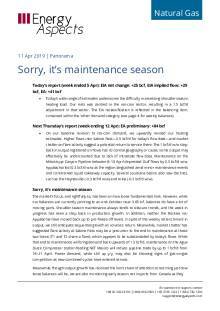 That pendulum is clearly weighing on market sentiment as the return to an 80 bcf withdrawal signals to some that winter is effectively over, although our balances are pointing to an end-March inventory position just below 1.1 tcf. Despite the US Midwest bearing the brunt of the arctic vortex, the cold provided a perfect case study to test Eastern Canada’s new gas equilibrium. We have long maintained that Dawn’s pricing would decouple from regional storage levels, as the 1 June start-up of the 0.5 bcf/d Rover Phase 2 would be able to take US gas into Ontario via its Vector Pipeline interconnect (see Monthly: Canada – Market tremors, 19 December, 2018). In practice, the new supply capacity means Dawn price spikes are now only likely during extreme cold spells or rare bouts of eastern TransCanada pipeline maintenance. As temperatures in Toronto dropped to -4°F on 30–31 January, Dawn saw its first major price rally of the winter with Dawn prices peaking at $5.11/mmbtu, up by $2.07/mmbtu d/d. This represented a $2.15/mmbtu premium to Henry Hub after Dawn’s average seven-cent discount in January. Eastern Canada pulled 29 bcf from storage last week, more than double the region’s five-year average of 14 bcf, not just to account for a spike in res-com demand but to replace declining US gas imports too. A key factor in the spiking Dawn prices came from gas flows at the St. Clair point in Michigan where Vector crosses the border, which fell by 1.0 bcf/d d/d on 30 January to 0.5 bcf/d, then dropped another 0.4 bcf/d d/d on 31 January as US northbound gas exports ground to a near-halt. St. Clair had seen 2.0 bcf/d in gas move across the border into Canada from 1 November–28 January. The 3.0 bcf lost in total US imports between 29–31 January represented over 10% of the region’s total weekly storage withdrawal. Chicago’s need to hoard gas for itself was the lynchpin of cross-border gas flows during the cold. Vector receives 0.1-0.2 bcf/d from the Northern Border pipe on an average winter day. Originating at the Canadian border in Montana, Northern Border cuts southeast to Chicago through many states in the crosshairs of the recent freeze. 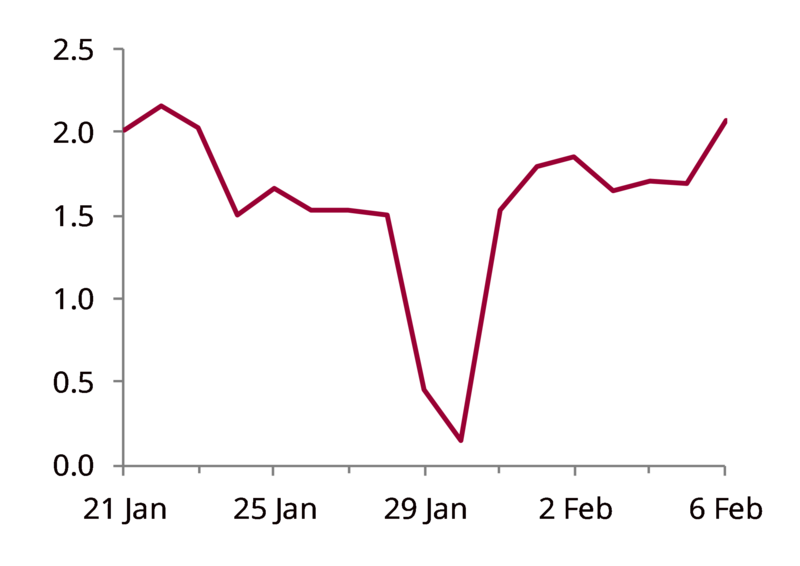 Deliveries from Northern Border to Vector fell to zero on 29–30 January. The Alliance pipeline follows a similar path and also connects to Vector just outside of Chicago; its Vector deliveries dropped by 0.3 bcf/d d/d on 29 January to just 50 mmcf/d, limiting the amount of gas that would reach Canada through St. Clair. Even the previously rock-solid dependability of Rover deliveries was disrupted by the cold. 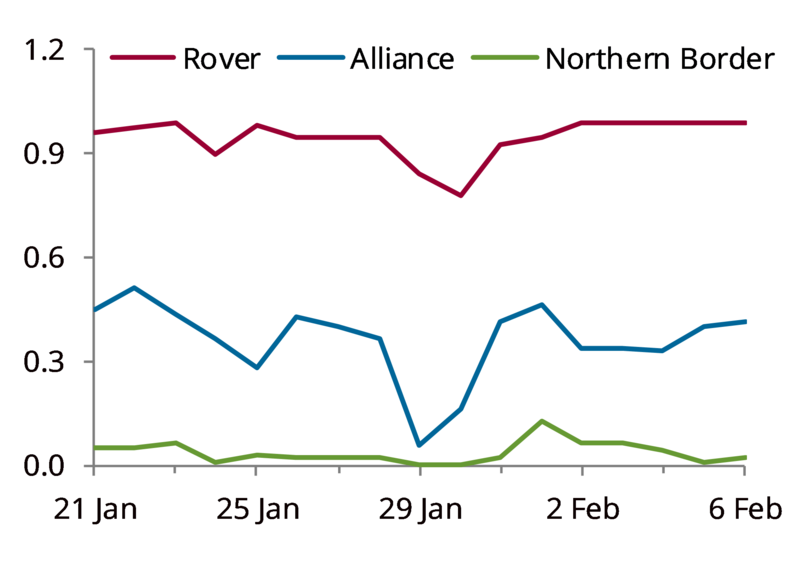 Rover had sent 1.0 bcf/d onto Vector every day of the heating season until late January, but those deliveries fell to 0.7 bcf/d on 29–30 January. The decline was accentuated as Appalachia suffered freeze-offs last week, with regional receipts down to 28.1 bcf/d on 31 January. The region’s prior week average was 29.5 bcf/d, a level already depressed from 30.8 bcf/d in early January by mid-month freeze-offs. Some Rover flows may also have been diverted from Vector to other points in Michigan, as a 30 January fire at Consumers Energy’s Ray Compressor Station in Armada, MI, combined with the surge in heating demand, caused gas shortages that led to pleas to conserve gas (despite the arctic temperatures) and closed major auto plants state-wide. While the US flows that Canada has come to depend on were interrupted for three days, their quick restoration limited the spike in Dawn prices. After peaking at $5.11/mmbtu on 30 January, Dawn immediately shed its gains and closed at $3.26/mmbtu on 31 January. By comparison, amid January 2018’s similar cold snap, Dawn cash price rose by $5.30/mmbtu d/d on 2 January 2018 to a peak of $9.00/mmbtu and stayed above $6.00/mmbtu for three days. Those peak price episodes pre-dated Phase 2 of Rover flows, which has limited Dawn’s upside during this heating season (see Monthly: Canada – A new Dawn rises, 29 August, 2018). Our forecast through the end of winter calls for Dawn to return to a slight discount to Henry Hub of less than a dime, as there remains little upside for Eastern Canadian prices. Even when all the potentially bullish factors aligned—disrupted US pipeline imports, regional production losses, and gas shortages in northern border states—Dawn saw just one day of significant price gains. This also informs our view for the coming injection season. Our forecast calls for Dawn to be at an average $0.30/mmbtu discount to Henry Hub. Last year’s summer Dawn average was almost perfectly flat to the Hub, but the new normal for eastern Canada looks very well-supplied. The cold is set to return in mid-February with a spate of 150-200 bcf withdrawals rounding out the month after next week’s report. Current 15-day forecasts show cold taking aim at the western US. Our end-March carryout now stands just below 1.1 tcf based on those forecasts and 10-year normal weather through March. Though Henry Hub cash is at its lowest level this winter, closing 6 February at $2.56/mmbtu, it might only take one bout of sustained cold to push the heating season’s carryout below 1 tcf. Winter is not quite over yet.